File with confidence with El Nido Family Centers’ Pacoima FamilySource Center Volunteer Income Tax Assistance (VITA) site and keep more of your hard-earned money. IRS-certified volunteers provide free basic income tax return preparation with electronic filing to qualified individuals. Free tax prep for city of Los Angeles residents is by appointment only, please call us at at (818.896-7776). 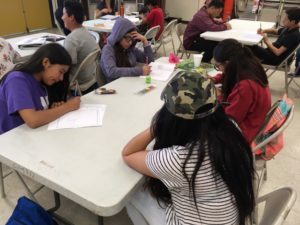 The FamilySource Centers (FSC) are collaborative one-stop community centers designed to assist low-income residents in the City of Los Angeles to become self-sufficient by increasing family income and academic achievement for youth and adults. FSCs offer services including; counseling, parent education, employment assistance, legal aid, financial literacy classes, adult education, tutoring & homework help, benefits screening, recreational & cultural activities, youth leadership development and community events. All FSCs have universal access services available to all persons. Additionally, case management services are available to low-income parents and guardians, and their children 17 years and under. El Nido’s FamilySource Center (FSC) in Pacoima has been designated as one of the best performing in the City, earning a 4 Star rating in 2017 and 2018. A few of the services offered at the Pacoima FSC include; parenting classes, General Education Development (GED) testing, El Nido’s Business and Tech Academies, Garden To Table cooking classes, immigration legal aid, English as a Second Language (ESL) classes, a Women’s Support Group, gardening & music classes, case management and a College Corner with assistance from the El Nido Alumni Association. Several community partners offer services including; mentoring & tutoring provided by FSC partner Pacoima Beautiful, Financial Literacy classes sponsored by Citibank, and Folklorico Dance and Art class provided by Tia Chuchas Centro Cultural.